Bill Watterson retired from writing and drawing “Calvin & Hobbes” about 18 years ago, but another illustrator has picked up his torch to pen some sound advice for young Americans. 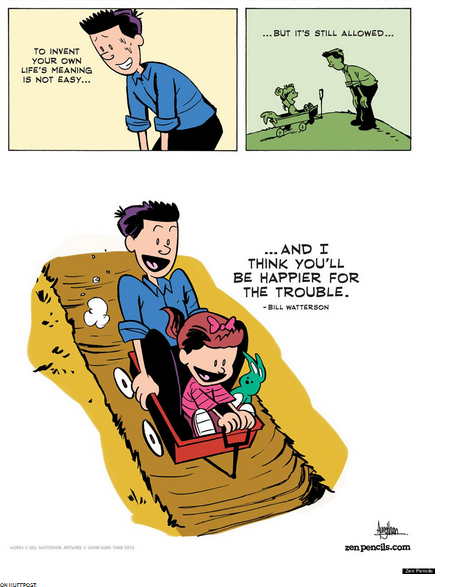 Cartoonist Gavin Aung Than, who pens comics on his blog Zen Pencils, created this tribute to Watterson that has struck a chord with the Internet over the last few days. Than took the text from a commencement speech Watterson delivered at Kenyon College in 1995, and illustrated it in the style of “Calvin & Hobbes.” He explains that this is the first time he’s intentionally attempted to mimic Watterson, although the man has been an inspiration for his art as well as his career. If you want to buy a print of Than’s cartoon, you may be out of luck. He explains that since Watterson famously refuses to license his work, preferring to let his art speak for itself, selling this “would be against the whole spirit of Calvin and Hobbes.” However, you can (and should) click over to his site and browse his other, non-Watterson related artwork.